Eight combat-ready North Korean divisions, led by 120 Soviet T34 medium tanks and extensive mobile artillery, crushed the four combat-ready ROK infantry divisions, and butchered a path down the peninsula until they were stopped at the Pusan Perimeter. 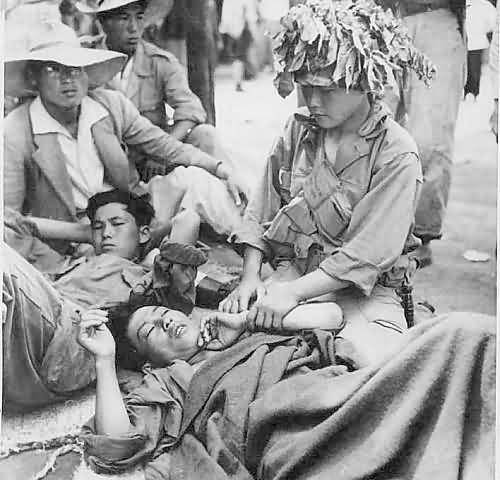 In the early fighting, ROK wounded could often be evacuated to military hospitals by rail, as these soldiers were. Later, when most of the fighting was in mountains and ridges, whether while still engaging in battle by maneouver or in the eventual trench warfare, helicopters were commonly deployed. These lightly armed troops, after the main ROK forces were trapped and destroyed by the North Korean surprise attack north of the Han, did the best they could.